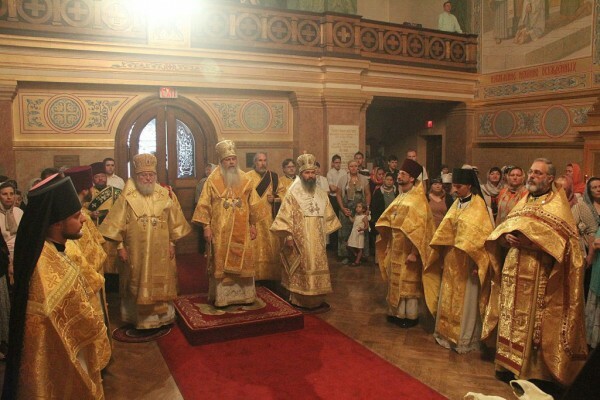 NEW YORK: On July 21, 2014, St Nicholas Patriarchal Cathedral in New York hosted a culminating solemn celebration the 700th anniversary of the birth of St Sergius of Radonezh in the Patriarchal Parishes in the USA. With the blessing of His Holiness Patriarch Kirill of Moscow and All Russia, Divine Liturgy on this day was celebrated by His Eminence Metropolitan Tikhon of America and Canada (Orthodox Church in America). He was joined by His Eminence Metropolitan Hilarion of Eastern America and New York of the Russian Orthodox Church Outside of Russia and by His Eminence Archbishop Justinian of Naro-Fominsk, Administrator of the Patriarchal Parishes in the USA. The hierarchs were joined by clergymen of the Moscow Patriarchate, the Russian Church Abroad and the Orthodox Church in America. Heguman Nikodim (Balyasnikov) read a sermon before Holy Communion. At the conclusion of Liturgy, Metropolitan Tikhon and the other clergymen sang the praise and exaltation of St Sergius before his miraculously revealed icon—one of the holy items of St Nicholas Cathedral. “The Orthodox Church has a good tradition: when a saint is glorified in one Local Church or another, his name and biography are shared with other Sister Churches. This bears witness to the unity of the Church of Christ, which carries out its salvific service throughout the whole world. By this we attest to the fact that a saint of any other Local Church is a saint of our own as well. Archbishop Justinian then gave the honored visiting hierarchs silk fabric for a metropolitan’s mantle depicting wellsprings and tablets. In his response to Archbishop Justinian, Metropolitan Tikhon expressed his gratitude to His Holiness Patriarch Kirill, and to Vladyka Justinian himself for the invitation to share the joy of prayerful communion on the day of the 700th anniversary of the birth of St Sergius with the clergymen and parishioners of the main church of the Moscow Patriarchate in the US. Metropolitan Tikhon then thanked Vladyka Justinian and gave him a memento. His Beatitude also gave Metropolitan Hilarion and Archbishop Justinian icons of St Tikhon, Patriarch of All Russia, and a Paschal egg depicting St Sergius. The hierarchs, clergymen and laity then shared a festive trapeza luncheon.